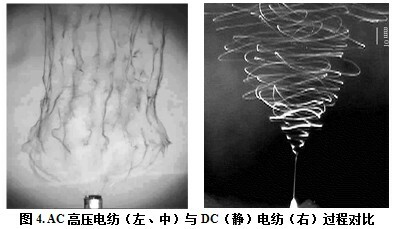 来自德国Dienes Apparatebau GmbH公司的Christian Thum做了“Centrifugal Spinning of Nanofibers Stepping Up in Productivity”的报告。该公司的HyperBell离心静电纺丝技术（图3）具有产量高、纤维分布均匀，纳米纤维网厚度均匀（CV for Basis weight=14～26%）的特点。离心静电纺丝头旋转速度高达50000 rpm，单头产量高达～3kg/hr，纤维最小直径可达80nm. Novel Superhydraphilic P(LLA-CL)/Fibrinogen Electrospun Scaffold for Tissue Regeneration，Hongbing He, Ph.D., Founder & CEO, Shanghai P & P Biotech Co., Ltd.
Anionic Nanofiber Filter for Trace Metal Removal in Ultrapure Water，Takahiro Kawakatsu, Dr. Eng., Senior Researcher, Kurita Water Industries Ltd.
Nanofiber Filter Media for Residential and Commercial HVAC，Thad Ptak, Ph.D., VP of Research &Development, Columbus Industries Inc.
Industrial Scale Nanofiber from Molten Plastics，Leonard Torobin, Chief Executive Officer, Nanofiber Technology, Inc.